1- I'll just read the Barbara Brackman blog. It really is interesting. But I am going to pass on making more blocks. 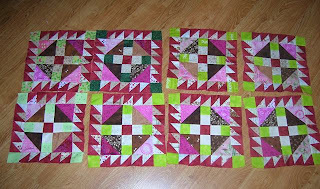 2-Those blocks I have completed..I am sending them to the Carisbrook Flood Quilt Project that I read about on the Moose on the Porch blog. 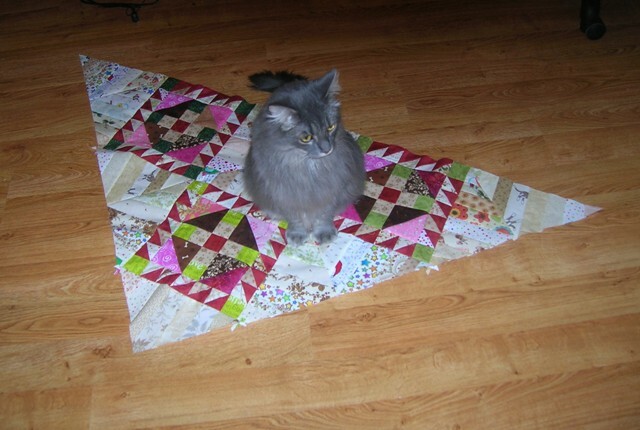 Someone can stitch them into a quilt for a needy person. I have so many UFO's around here, I should not start anything else. So where was I today? That would be out at Sweet Home doing the 5th Saturday Challenge! And I haven't a clue what I will make out of the contents of the little brown bag. Work this week was, in a word, horrible, awful, %$^#@& Well I guess that is more than one word but you get the gist. I finally got around to calling someone to replace my garage door opener and I had that done Friday afternoon. Shut down the computer and left early! New working opener in place-no more doing the garage door dance twice a day. I'm a happy camper. Still enough time to head over to Sweet Home for some therapy. I needed to pick up first month of Comfort and Joy block program. 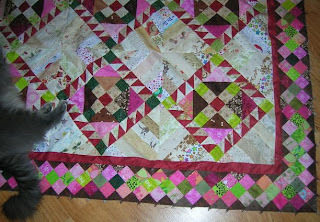 I happily discovered that I don't have to deal with heinous applique until month three! Oh happy day!! 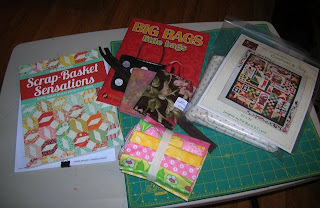 That pretty little bundle of happy fabrics makes my heart sing. That fabric had just come in on my last visit and I asked them to make me a bundle and it was waiting for me yesterday. I spotted Kim Brackett's new book and it was 1-800-GOTTA HAVE. 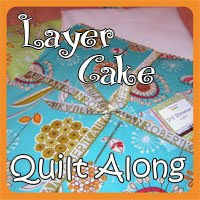 OMG is this a great book I don't know which quilt I want to do first! Also came home with another book by Terry Atkinson. I spotted a cute little bag and now that I have mastered(?) zippers I thought I would try another pattern. 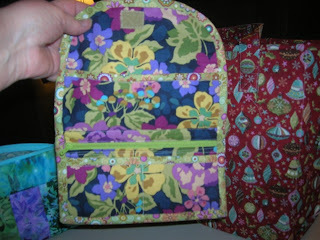 I got 2 fat quarters and a zipper for that project. All in all it was an expensive day but this morning I feel a lot less stressed and I slept quite well last night-on the couch and later in the bed. Today is THIMBLES!!!!!!!! I stopped by last evening to say hi to the Friday nite gang but today I will be sewing. I already have my spot! This month' s Groovy Girl project...not great but my first attempt. The velcro isn't exactly centered and no button. Don't know what I will do with this. 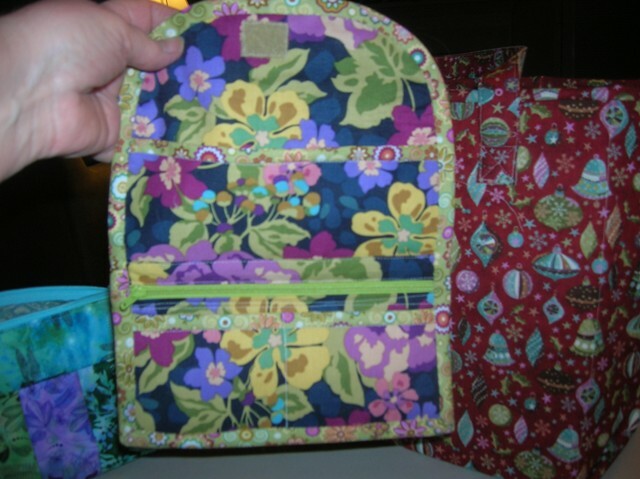 Inside-pockets, zippered section...not too shabby. Gonna be getting my punch this month! 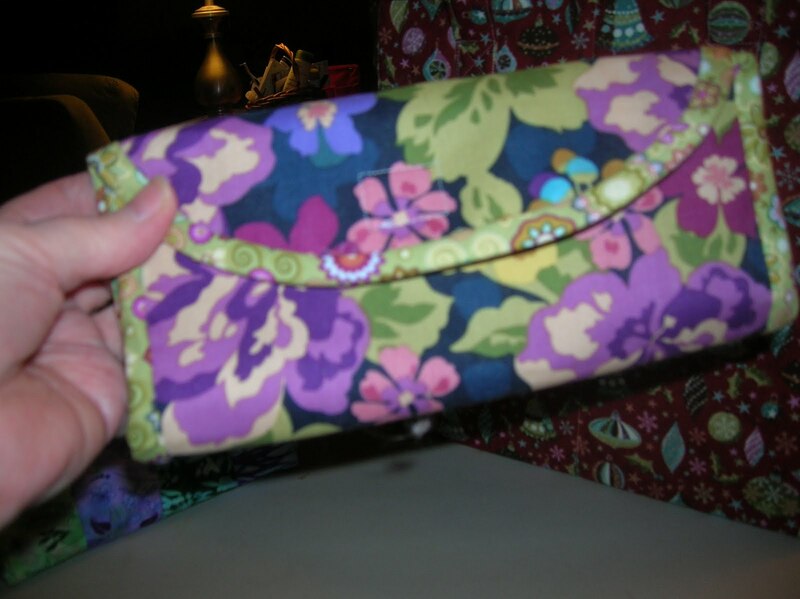 Another pattern I bought. I think it is called Zippy Strippy. 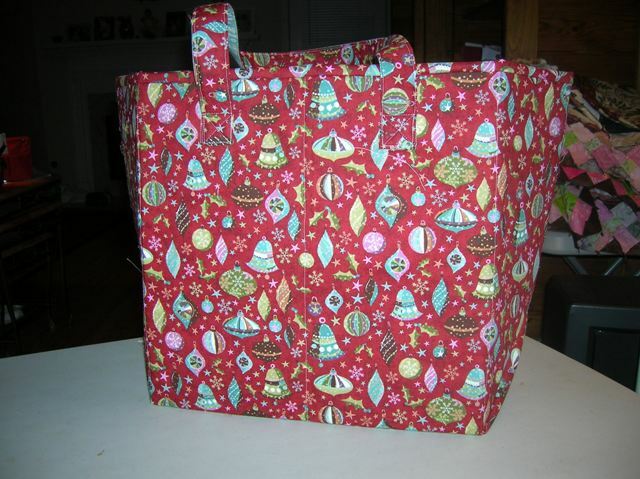 I did better with this zipper. Stand and Stow that I cut out way before Christmas. So it has a Christmas pattern. I made one for Alice for her birthday last October. 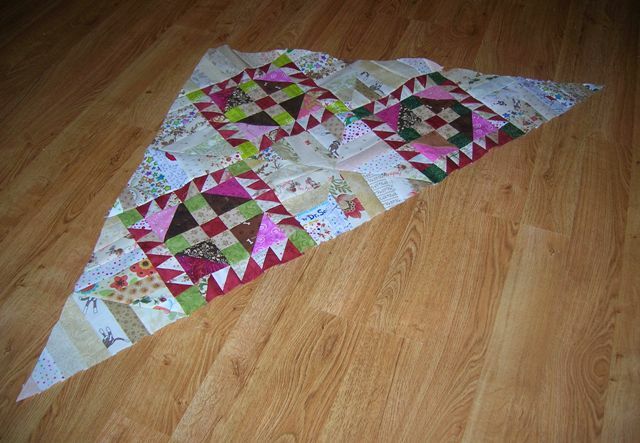 I also finished a pillowcase to go with the quilt currently on my bed(Carolina Christmas). I cut out 2 in November and this one sat and sat...now it is done. I may have not gotten around to getting dressed today but I think I accomplished quite a lot! I am here to tell you that this week has been very rough. 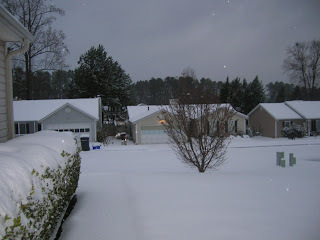 First snow, then ice and then lots of whining by the woman in the house. As for me, no problemo. 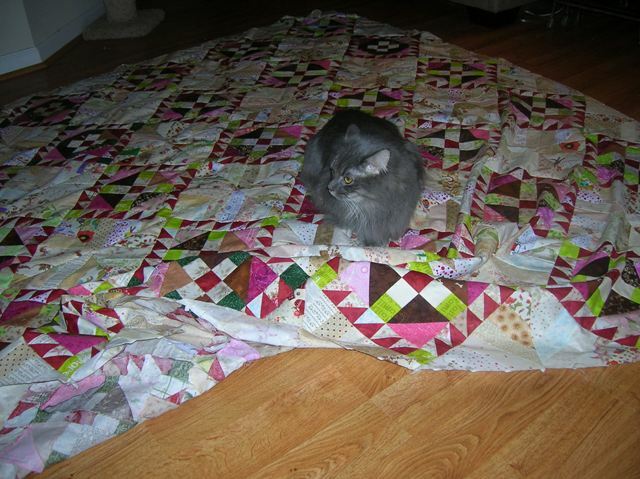 Fat Quarter, Bolt and the kittens and I got comfy and watched a lot of TV and did other indoor things. My only complaint was that the food got a little monotonous toward the end of the week. I am thinking that perhaps I need to find another home where this crappy weather does not play into the overall picture. My van stayed in the garage as I did not feel the need to venture outside. I have vacation plans upcoming. 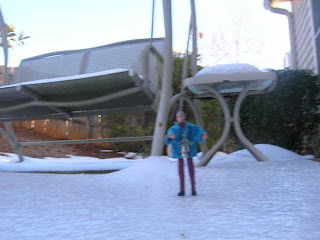 I sure hope it does not snow in Elijay again this year when I travel with the Thimble women. FYI: Fat Quarter is coming with me this year, so girls you will need to tone down the attention toward me. She gets a little jealous. We are also going on a cruise this Spring to a warmer climate. Not that I don't like looking at other people's pictures of the snow. I just wish they were in some other state-far away. I am so over this mess. Henry is bored with the whole topic too. And he just avoids looking out the window by hunkering down under a quilt. I really didn't mind being housebound earlier this week. Finally getting to work yesterday and having to play catch up for the missed days. Not to mention the state of the roads! I did it!!! I was bound and determined to get this puppy done. 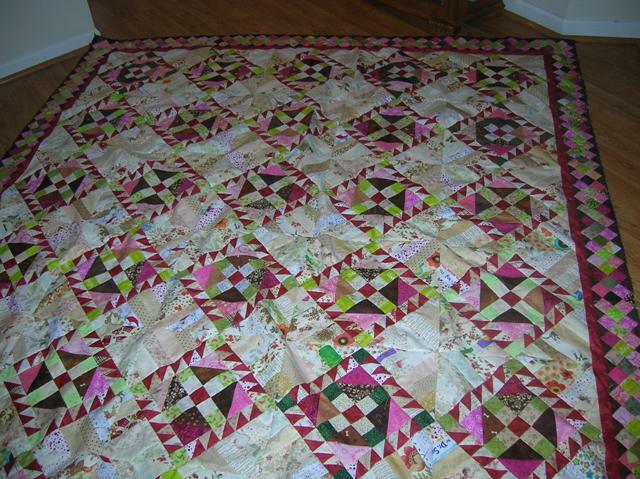 And it turns out to be one rather large quilt top with millions of itty bitty pieces. I finished it between ventures outside to hammer the ice off the driveway. As usual, Wild Willie is present for the inspection. From my front door. The car is safely in the garage. Not quite sure how I ma going to get down the driveway. Nothing is moving in my neighborhood. Hopefully when I do need to get out, it will be better. Here is block 2 for the Civil War quilt. It is a variable star. 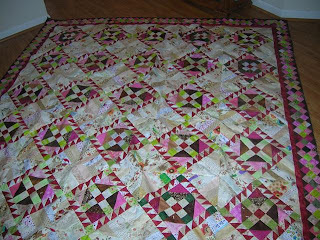 Barbara Brackman calls it Northern Star. I am continuing to work on RRCB. 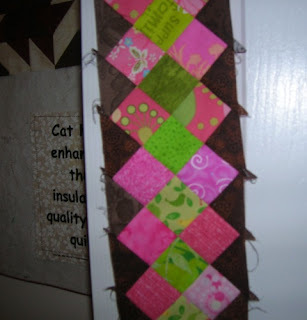 Here is one side border. I played with the inner border options. 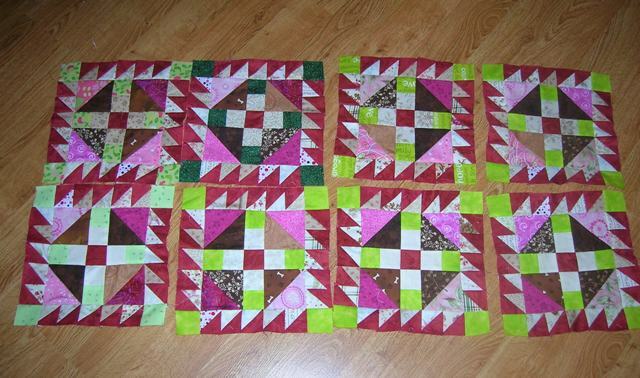 I thought about a medium green but then I saw the red on Michelle's quilt and since I still have some of that red left, I will go with the red. 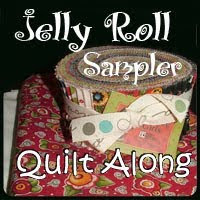 While reading blogs this morning, I read Michelle of Quilts and Stuff. She has posted pictures of her RRCB which is really beautiful. She is completely done. I have finished the main body but have yet to do the borders. 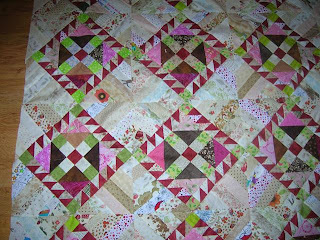 So many little pieces and so many seams..
My inner border will be a medium green with little red flowers in it. But I need to take a break, as I have been at this since this morning with few time outs! Wild Willie is again checking on the progress. Henry is on the couch waiting for a nap partner! Spooky? he's about somewhere. He really likes my closet as there are some quilts on a chest in there. The house is getting cool early today. This morning's sun and blue sky are gone and the clouds have moved in. Must listen to the weather report to see what the forecast is now saying. Snow..sleet..ice...all of the above...just not nice! 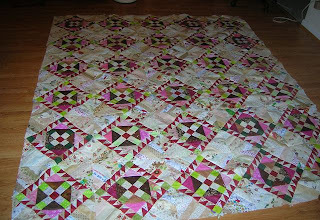 Now I think I will make the second block for the civil war block of the week. I keep plugging along on RRCB. So many pieces! I have all 50 blocks made for the center and I decided I wanted to see how they look. My brown/pink blocks are not the same in each block. I guess I missed that in the directions. But I like mine just fine..so there. Lots more to sew, figure out the inner border and then begin the outer pieced border. Wild Willie needed to put his paw of approval on my work so far! 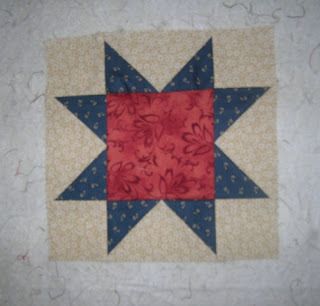 I have been watching the Civil War Quilts site and now that the second block is posted, I decided it was time to make the first block. Just what I need - another project. I am enjoying her commentary as well. 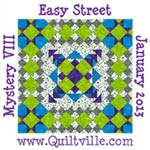 This block is called "Catch Me If You Can". And speaking of more projects..Bonnie posted a new one on her site this morning. I luv it but I will contain myself until I finish RRCB. The weather forecast for the next couple of days is not great. Talking about more snow. What happened to global warming? It can snow-I have cat food and spaghetti. I went out to Groovy Girls this morning. I wanted to make sure I had thread if the weather turns really bad. 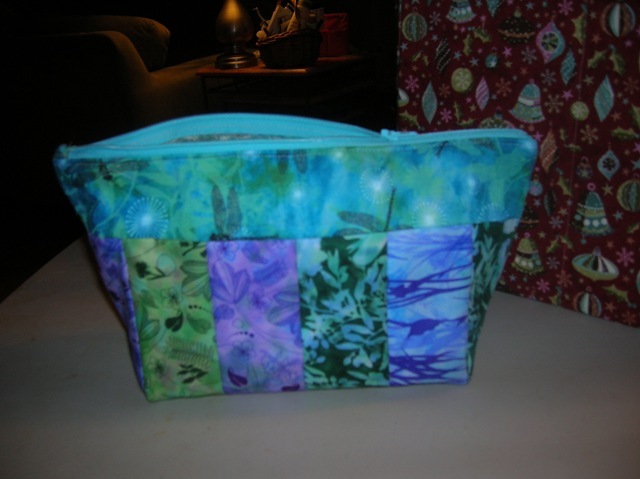 I never got around to last month's project-no punch for me this month! But I have been busy with RRCB and our Thimble swap. 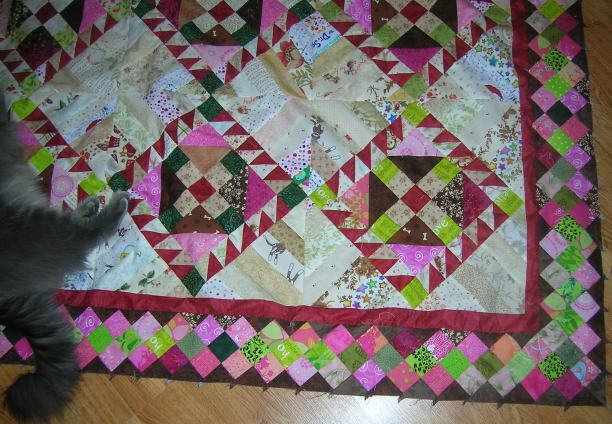 This is almost done-just an outer border. Should be able to complete this tomorrow. January is kind of a dark period of the year-days are short and mostly it is cold. Cold for me is 30 by the way. I live in the South now! At any rate, I was reading Nancy's blog and she was talking about a death and how the family involved dealt with it. I work in a SNF (Heaven's waiting room) and we have lost 2 residents in the past two days. It is not uncommon around the holidays. Death usually comes in threes, so we have one more to go. Funny thing is that usually one of the three is unexpected. 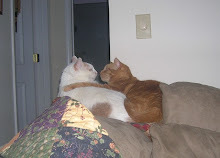 The 2 so far this week were both on hospice. And on was a long time resident who had spent a good portion of his life there. 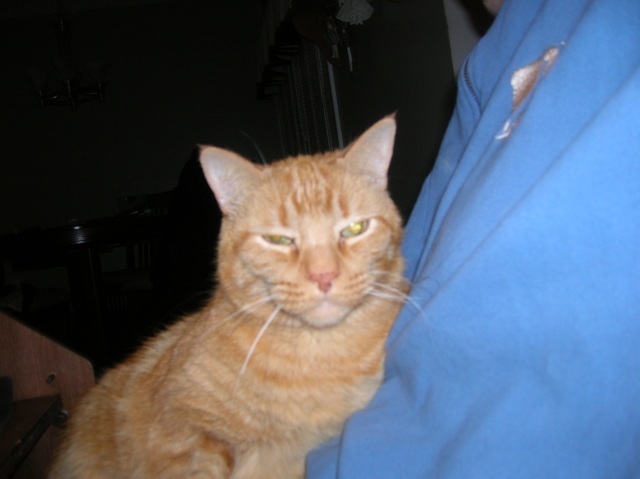 It is a loss for those he leaves behind but I can celebrate that he is now in a better place-free of pain. 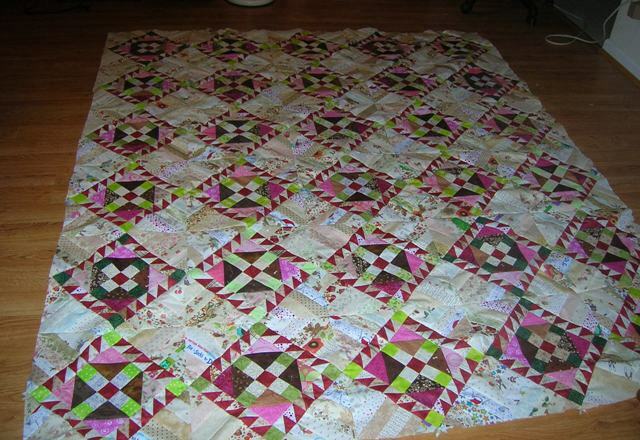 On a much brighter note...all the stars are on the swap quilt. I just need to add a border and she's done! I need to get back to RRCB. 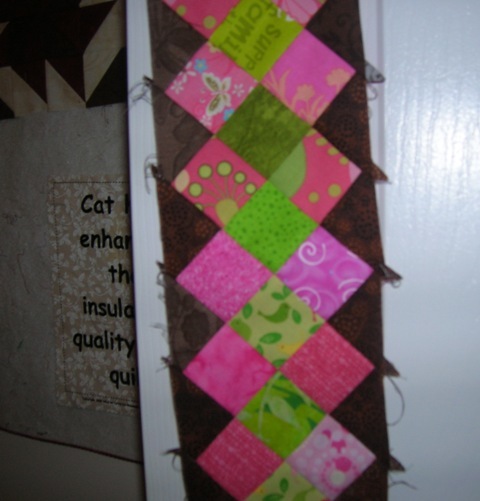 I have wacked all of the string pieces in half and need to sew them together. If there is nothing on tv, I just might sew a few tonight. Still have 22 of the other blocks to finish constructing. Spooky sat on my lap while I finished a book on my Kindle this afternoon. 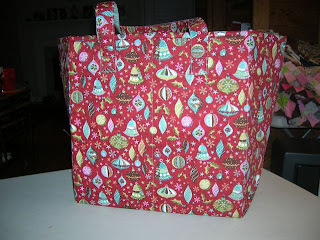 I've been doing some serious sewing for the past two days. Working on Roll Roll. Cotton Boll as well as the Thimbles Swap. Plugging along on RRCB, so many little pieces. The swap top is almost finished. I have decided I am not finishing it as it is in the book. I don't like that the stars are not finished around the edges. 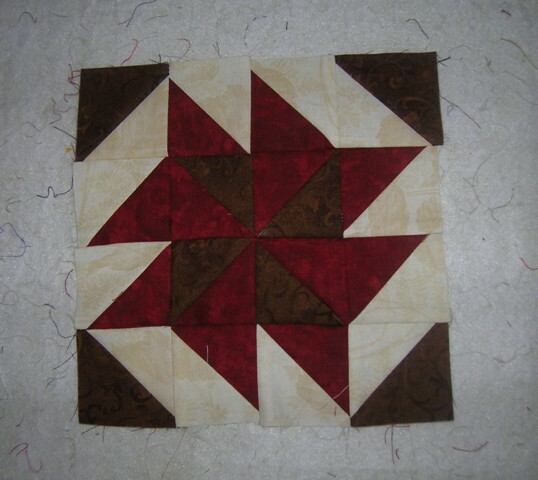 So I am thinking I am going to finish the points as part of the first border. Then I guess I will decide whether or not to put on the flying geese units. Perhaps the geese have gone South? Feeling a little lazy. I did make the bed, showered and changed into fresh jammies. Only wish there was a sappy movie on-that would make it a perfect day!